George-Marios Angeletos, Fabrice Collard, and Harris Dellas « Quantifying Confidence », Econometrica, forthcoming. Pierre-André Chiappori, Bernard Salanié, François Salanié, and Amit Gandhi « From Aggregate Betting Data to Individual Risk Preferences », Econometrica 2019, vol. 87, n. 1, January 2019, pp. 1–36. 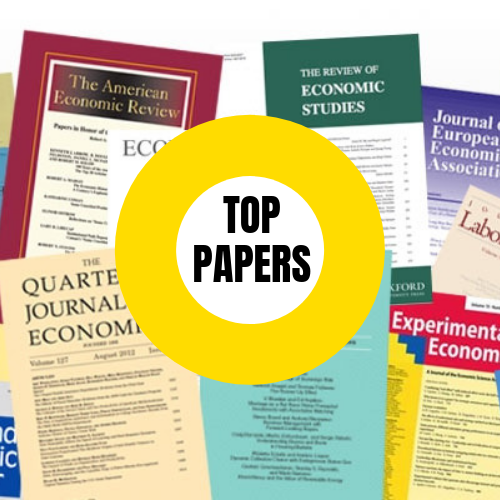 Daniel F. Garrett, Renato Gomes et Lucas Maestri, « Competitive Screening under Heterogeneous Information », The Review of Economic Studies, 2019, fortcoming. Bruno Jullien et Alessandro Pavan, « Information Management and Pricing in Platform Markets », The Review of Economic Studies, 2019, forthcoming. Aurélie Ouss and Arnaud Philippe « No Hatred or Malice, Fear or Affection": Media and Sentencing », Journal of Political Economy, vol. 126, n°5, October 2018, p. 2134-2178. Jean Tirole and Guillaume Plantin, "Marking to Market versus Taking to Market", American Economic Review, vol. 108, n. 8, August, 2018, p. 2246-2276. Pierre Dubois, and Laura Lasio « Identifying Industry Margins with Unobserved Price Constraints: Structural Estimation on Pharmaceuticals », American Economic Review, vol. 108, n°12, December 2018, p. 3685-3724. Pierre Dubois, Rachel Griffith et Martin O'Connell, « The effects of banning advertising in junk food markets », The Review of Economic Studies, vol. 1, n°1, January 2018, p. 396-436. Paul Beaudry, Dana Galizia et Franck Portier, « Reconciling Hayek's and Keynes' Views of Recessions », The Review of Economic Studies, vol. 85, n°1, January 2018, p. 119-156. Renato Gomes, Jean-Marie Lozachmeur et Alessandro Pavan, « Differential Taxation and Occupational Choice », The Review of Economic Studies, vol. 85, n°1, January 2018, p. 511-557.